Mark comes to us from Woodmen Valley Chapel in Colorado Springs, where for the past year he served as Congressional Care Pastor (pastoral care and counseling with a focus on families with teens). The previous two years he oversaw the Student Ministry Department. Prior to Woodmen, Mark spent four years leading the student ministry at Cherry Hills Community Church in Highlands Ranch. Mark has served students and their families for 30 years in small and large church settings both portable and multi-site. 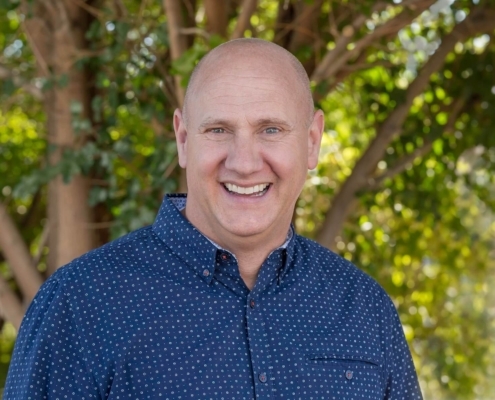 Mark grew up in Naperville, IL and has served in ministry in Florida, Maryland and Colorado. He has a degree in family counseling and has training from Reformed Theological Seminary and Denver Seminary. Mark and his wife, Rose, have been married for 31 years and they have two beautiful daughters, Lauren (19) and Amelia (16). Mark’s passions are Jesus, his family and the local Church. In his free time, he likes to explore Colorado in his jeep and hike with his family. He also likes to help others as a handyman, and he enjoys fencing (as in sword fighting). He values any opportunity to encourage others who serve in ministry.